Well, thank goodness, it was a sort of mini-flu type thing. Felt absolutely sh*t for three whole days, but today I feel fine. Have been up, about, buried the dead mouse the cat left me, emptied bins, sorted out washing and paperwork, busy busy busy. New trousers I’d ordered from John Lewis came today. Horrid. Going back. New bra from M&S also. Lovely. In drawer. Also new Simon’s Cat book – the one about his new kitten. Excellent. Laughs on every page. And have two new tops from Laura Ashley. Also lovely, on hangers in wardrobe. Off to RSC soon with family – can’t wait! love it there. Also have a voucher for some beauty treatment – at the moment am leaning towards a stone massage. And possibly a manicure. Wrote my mother’s thank you letter – she does a box of bits and bobs, all carefully thought out and appropriate. Cat is frightened of toy baby penguin I bought. I love penguins to bits, but the real things is a bit smelly and unsuitable as a pet, I’m guessing, particularly in the temperate climate here. And not sure the cat would be too impressed. She’s not too impressed with the toy one, even, so it’s a good job I haven’t bought a real one. Kidding. Have had to cancel/postpone lunch with my lovely sister and her husband though. They were supposed to be coming over on Wednesday. I was going to do home made pizza and home made trifle. But was just too poorly and pathetic. We’ll see them soon somehow or other. Oldest grandchild (OG henceforth) has a mobile phone! how exciting! can’t wait to see it! mine is at the menders’, been fixed, coming back soon thank goodness. Old phone is ok and works but doesn’t do the calendar thing. ED has bought me special gloves which have a fingertip thing which works on touch-screen phones, and a thing which you can use to tap them with, because I have trouble sometimes with the keyboard being so small on such a small screen. Hooray! and an Amazon voucher which I’ve spent on Simon’s Cat kitten book (see above). Am not very well. A very mild form of flu I think. Slept all yesterday, all night, most of today, and at least was able to take painkillers from this morning, so the aches and pains have subsided somewhat. Very wobbly and pathetic, but have managed to have a shower, with my special seat for pathetic people in there so I could sit down and wash.
Christmas was lovely, however. Very peaceful and restful. Some lovely, lovely presents. Must do thank you letters. Saw YD on Xmas day, ED came to stay on Boxing Day, and it was the day after that I started to feel ill. So had to cancel lunch with my sister and her hubby. They were going to come over today. But we can re-arrange when all is well again. Well now. A busy week. Monday I had my hair cut and met my friend for lunch. Solihull was absolutely heaving, so I took a taxi there and hubby came and fetched me. I was exhausted, but it was wonderful to see Fiona. We used to work together at Solihull Council, and she still works there. We meet most months, when I have my hairdo. Tuesday I slept! Wednesday my mum came over so we exchanged presents. Thursday morning I went to see my old school friend, home, lunch, early sleep, then another old school friend came round in the afternoon. Deb has just given up work – hooray, say I. She’s been so ill and stressed these last few years, I’m really glad she’s stopped working now. Time for her to rest, relax, and get well. Then knitting group in the evening, which was a really good laugh. Friday we had the shopping delivered and I did my ironing. The shopping was a bit fraught, actually, because Waitrose’s delivery van broke down, so instead of being delivered between 1 and 2 pm, it arrived by taxi at about 3.45 pm. But what a good idea! and how fraught for them! I was expecting lots of things to be missing or wrong, but no. Excellent. Today have cleaned the bathrooms thoroughly, including the shower heads and floor, and hubby and I have made up the guest bed for ED and chap on Monday, when they are coming to stay the night. So, all ready for Christmas really. Final load of washing just finishing (it’s the dish cloths which get changed every day, and we were running out). It’s a boil wash, so has taken two hours. But nearly done. Coffee cake, filling and syrup defrosting ready to do. Cat washing her nether regions. Lovely. House clean, hubby has vacuumed, feeling very smug. Lunchtime, then ten minute walk, then sleep I think. Well, it’s having to go back to be repaired. Every time I took a photo with it, it just switched itself off. After several hours on the phone to Virgin, it transpired that it’s unstable because it has old “firmware” on it, and is refusing point blank to update itself. Hmph. Tried absolutely everything. Different battery, soft reset, hard reset, followed all the instructions given to me on the phone and on the internet. No joy. Luckily I have kept my old phone, which works fine but doesn’t do my calendar. Virgin will send me a jiffy bag, I’ll send it back, and they’ll repair it. Or, if they can’t, I suppose they’ll send me another phone. Today am off to hairdresser in Solihull. But I just know I won’t be able to park, as it’s THAT time of year. So am ordering a taxi, because hubby has had to go back to the flipping hospital again today and is currently either at the hospital or struggling through traffic. The cat was particularly affectionate this morning – a paw round each side of my neck while she snuggled her head under my chin. Until she spotted the lights on the Christmas tree, and wanted to pat a bauble. Just gently, you understand. Watched “The Green Zone” last night. Very good. Tense, but good. Right, must go and shower/arrange taxi. Sunday we went to Malvern, to see all five grandchildren. Harvey (10) and Toby (7) are like twins, even Rocky (Toby’s brother) can’t tell them apart! Alice (7) is taller than Lucy (10) ! it was lovely to see them. Love them. Tuesday people came to our house to clean all the downstairs carpets, the stairs, and the sofa and chairs. So Monday we had to sort everything out to make it easier for them. Also, I went to YD’s house (she was at work) because I felt I was in the way otherwise. Hubby stayed here with the cat, but he felt the same. We’re very happy with the job they’ve done, it all looks new! Tuesday night everything was still wet, so we had to sort of camp! Wednesday everything had dried, so we had to put everything back in place. Thursday hubby went to the hospital for his eyes – he has cataracts. I went with him, because they use drops to dilate his pupils, so I had to drive afterwards. It was long and frustrating. We left the house at 2pm and got home at 6 pm. Friday I went out to lunch with my friend, and hubby went out in the evening with colleagues from his old school. But – all the baking is done and in the freezer, the Christmas tree is up (the cat loves it), the presents are all wrapped and/or sent, the shopping is ordered, and we are ready for Christmas. This year my mother is going to my sister, and for the first time it will be just Vic and me. Wonderful. YD and chappie will come to see us on Christmas morning, ED and chappie will come up at some point but we don’t know exactly when. Mother is coming on Wednesday 21st and we can exchange presents. My mother, in October, went to Scotland. In her car. She drove 1600 miles (2576 km). Amazing. She is Scots by birth, but has no accent. Her parents came to England when she was 3, and nobody could understand her, so she learned to talk like us (like them ?!). She had a wonderful time in Scotland, she loves it. She stayed at various hotels, booked before she went, and it was mostly good weather (I think she was very lucky!). She’ll be 80 next year, on 22ndApril, and she wants to do it again! For her birthday, my sister and I are taking her to see a musical in London. We’re going with all four girls. She’s delighted. 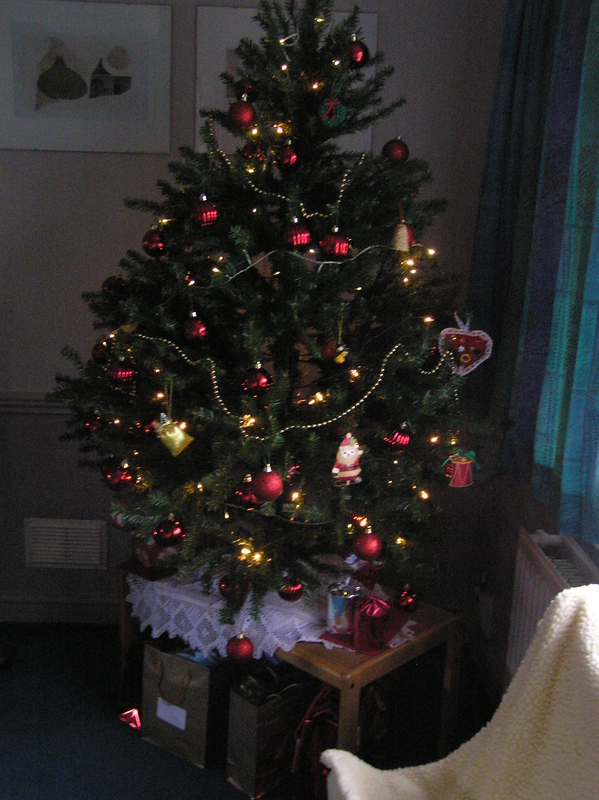 And here’s our Christmas tree! Hubby is 100% now. Everything’s fine. He goes for his 30 minute walk every morning, cooks, everything. Hooray! Well. Yesterday I received a phone call from the Podiatric Surgery place, and despite my having been booked in for the injections on 29th December, they had a cancellation today at 1.30. I jumped at it! So this morning I had to bustle about a bit, go to the doctor to get my prescription, give the doctor’s receptionists a big box of chocolates as I am such a regular visitor (at least once every month), get some bits and bobs, and then do my ironing. All because when I’ve had these jabs I have to rest for a day or two, in pain, and so needed all this stuff done beforehand. I was going to defrost and ice a coffee cake which is in the freezer all ready, because we’re off to Malvern on Sunday to see two of Vic’s sons and all five grandchildren, but I’m really not up to that. So bought some suitable cakes and macaroons instead. I’d like to say I was as brave as a lion. But I wasn’t. I just wasn’t. I didn’t actually cry, or faint, but I did have to be ministered to with cold water and the bed tipped up so my feet were higher than my head. Pathetic. Lots of deep breathing and trying to ignore it, but it’s no good, these steroid injections are just damn painful, and that’s that. I’m fine with blood tests, anaesthetics, flu jabs, you name it, but it’s not just the needle with these jabs, it’s when they push the plunger. Ouch. But all done now. Just recovery time. Phew. Well, this morning I went to the Post Office to post all the various parcels – one to the Republic of Ireland, one to France, one to my brother-in-law in Droitwich, one to John Lewis returning some goods I don’t want, and to get the stamps for the Christmas cards. The queue was halfway down the path. That means, I guess, approximately 30 people waiting. But all four tills were open, and so I only waited half an hour. That’s good going, I think. At the local sub-post office there are only two tills, and it’s not often enough they’re both open. I have waited more than 45 minutes at that one, and get very cross and harrumphy. Next, popped in for a cuppa with my friend Sue, who isn’t very well, and nor is her husband. She’s an Avon lady, so I picked up my bits and bobs from her, had a chat, and then I went to Boots in the retail park. Free parking and it’s a huge store. I wanted some new earrings, but they didn’t have anything I fancied, so just got my painkillers and came home. Doesn’t sound like much, but I was absolutely exhausted after lunch, and slept for 2 1/2 hours. Fish and chips for tea – not from the chip shop, they use milk in the batter, and four squares of chocolate and a tiny mince pie. Yummy. Yoghurt and jam later on. Tomorrow probably involves a trip to the tip. It’ll be cold but dry hopefully. Spoke to my Uncle Al tonight. His wife, my favourite aunty, has been poorly. Very poorly. But is on the mend now. Thank goodness for antibiotics, say I, and the National Health. The cat has been a pain tonight. Miaowing and miaowing with no clear demands. Usually it’s “food” or “let me out” but tonight I think she just wanted us to be all in the same room. She’s settled down now anyway in her little bed. My new Avon lipstick is nice. It’s not a solid screw-up one, it’s a sort of liquid with a little sponge pad to apply it, and it looks really nice. Sort of sparkly and “dewy”. And a lovely colour. Very pleased.